The ruins of Roche Abbey lie in the wooded valley of the Maltby Beck, about 9 miles from Doncaster and 13 miles from Sheffield in South Yorkshire. Now only a small part of the eastern end of the abbey church remains standing to any height. But this was once a splendid twelfth-century church, one of the earliest built in the �New Gothic� style in northern England. Roche was founded in 1147 and building began on the stone church in about 1170. Although never a large or wealthy abbey, Roche built up a moderate collection of land-holdings during the twelfth and thirteenth century and played a significant part in the history of the region in the later middle ages. Like other monastic houses, Roche was suppressed in the reign of Henry VIII, the monks dispersed and the abbey buildings destroyed. 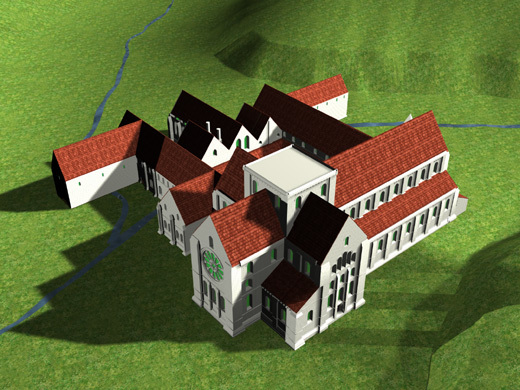 On the pages that follow you can read about the abbey�s history, lands and buildings and go on a tour of the models we have built of the church and the monastic precincts.